This lovely midsize pair of Bayeux French Club chairs were in deplorable condition when we found them , The frame and guts were sound but the leather was gone. 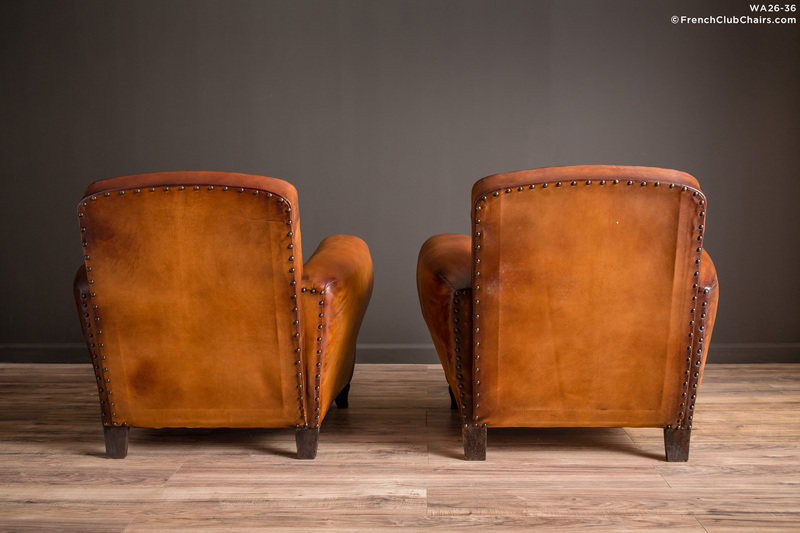 This pair definitely deserved our special attention and full restoration with our signature Pyrenees leather. The have an unusual deep set back that gives them a particularly gorgeous profile accompanied by a very comfortable seat. I have included a couple of their restoration shots to highlight the work done. Sourced in the town of Bayeux, also home of the famous medieval tapestry (The Bayeux Tapestry is an embroidered cloth nearly 70 metres long and 50 centimetres tall, which depicts the events leading up to the Norman conquest of England). This pair is from the late 1930s.